Corporate Executive Board, a leading provider of best practices research, has sold Toolbox.com to Ziff Davis, a leading technology media company. DeSilva+Phillips client, Corporate Executive Board has sold Toolbox.com, the #1 professional networking site for IT professionals, to Ziff Davis, Inc., one of the nation’s leading technology media companies. Founded in 1998 and based in Scottsdale, AZ, Toolbox.com supports decision-making throughout the IT life cycle by linking over three million IT experts and executives across the globe each month. Toolbox.com enables users to evaluate vendors, plan and manage projects, solve problems and stay current. Effective immediately, Toolbox.com will be a unit of Ziff Davis B2B Focus, which was formed earlier this year with Ziff Davis’ acquisition of Focus Research, Inc., a leading provider of online research to enterprise buyers and high-quality leads to IT vendors. The fourth acquisition for Ziff Davis in the past year, Toolbox.com gives the fast growing digital media company a professional networking site with 2.3 million registered members who ask and answer thousands of IT questions each month. 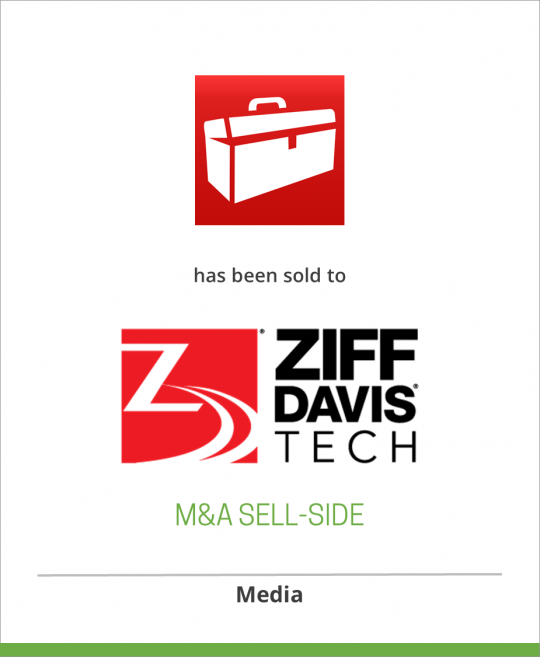 The media and lead gen offerings of Toolbox will strengthen Ziff Davis B2B Focus’ suite of offerings to IT marketers. CEB is a leading provider of best practices research and analysis focusing on corporate strategy, operations and general management issues. CEB provides its integrated set of services currently to more than 5,500 of the world’s largest and most prestigious corporations, including over 85% of the Fortune 500. These services are provided primarily on an annual subscription basis and include best practices research studies, executive education seminars, customized research briefs and Web-based access to a library of over 275,000 corporate best practices. For more information, please visit http://www.executiveboard.com. Ziff Davis, Inc. is a leading digital media company specializing in the technology market, reaching over 40 million highly engaged in-market buyers and influencers every month. Ziff Davis sites, which feature trusted and comprehensive evaluations of the newest and hottest products, include PCMag.com, ExtremeTech.com and Geek.com. Ziff Davis also operates BuyerBase™, the most advanced ad targeting platform focused on tech buyers and LogicBuy.com, a leading provider of deals and discounts on tech products. Ziff Davis B2B Focus is a leading provider of online research to enterprise buyers and high-quality leads to IT vendors. More information on Ziff Davis can be found at ziffdavis.com.